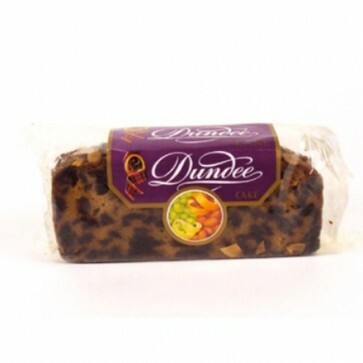 This famous Scottish cake has a lighter, more crumbly texture than other fruit cakes. It is baked with crystalised orange peel, demerara sugar, spicy nutmeg and is topped with crunchy almonds slices. Featured in our Luxury Christmas Hamper. Ingredients: sultanas (41%), free range whole eggs, glace cherries (12%) (cherries, glucose-fructose syrup, citric acid, preservative: sulphur), wheat flour, demerara sugar, butter, vegetable oils, crystallised orange peel (3%) (orange peel, glucose fructose syrup, sugar, concentrated lemon juice), invert sugar syrup, almonds (2%), nutmeg, orange oil, salt, malt extract. Contains: egg, milk, wheat, gluten, nuts. This product is NOT suitable for nut allergy sufferers.